Washington was consumed by a wild guessing game as to the identity of the writer, and swift denials of involvement in the op-ed came Thursday from top administration officials, including from Vice President Mike Pence's office, Secretary of State Mike Pompeo and Dan Coats, director of national intelligence, and other Cabinet members. First lady Melania Trump also weighed in, praising the free press as "important to our democracy" before attacking the writer, saying "you are not protecting this country, you are sabotaging it with your cowardly actions." Coats later issued his own denial, followed by Defense Secretary James Mattis, Housing Secretary Ben Carson, Treasury Secretary Steve Mnuchin, budget director Mick Mulvaney and others; and with several prominent administration members delivering on-the-record denials, the focus could now fall on other senior aides to do the same, with questions raised about those who stay silent. White House press secretary Sarah Huckabee Sanders tried to head off reporters' inquiries of Trump officials, tweeting that the questions should be aimed at The New York Times, which she said was "complicit in this deceitful act." 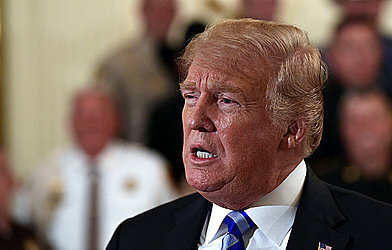 Trump, appearing at an unrelated event Wednesday at the White House, lashed out at the Times for publishing the op-ed. Down Pennsylvania Avenue, House Speaker Paul Ryan said he did not know of any role Congress would have to investigate the identity of the author, though Republican Rep. Mark Meadows of North Carolina, a Trump ally, said the legislative body could take part. "Nothing in this town stays secret forever, and so ultimately I do think we will find out who is the author," Meadows said.